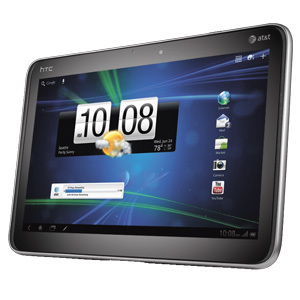 HTC’s 10-inch tablet which had been in the rumour mill for quite some time now by the name of Puccini is finally out. AT&T has officially unveiled the Jetstream which will be HTC’s first ever device to be powered by Android Honeycomb. The tablet has a dual-core 1.5GHz snapdragon processor, a 10.1-inch screen with a WXGA resolution, a rear 8-megapixel camera as well as a 1.3-megapixel front facing camera, microSD expansion slot, and a 7300mAH battery. The tablet will come with the Scribe pen technology, similar to the Flyer tablet. The 4G LTE enabled tablet is said to launch on 4th of September and will be available for $700 (REALLY?) on contract.